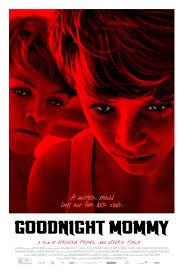 Goodnight Mommy is one of those films that will take your biological clock, kick it in the teeth, shove it into a trunk and dump it in the ocean. I will never again make a joke about my kids staging a mutiny and tying me to a chair. Writer/directors Verokina Franz and Severin Fiala certainly did an extraordinary job with creating a taut mystery. 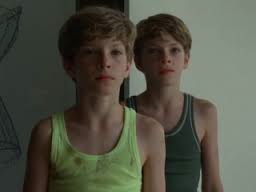 The most intriguing aspect of it, for me, was the way in which the relationship between Elias (Elias Schwarz) and Lukas (Lukas Schwarz) is portrayed as opposites as opposed to dual images of each other, proving that the duo needed each other in order to function as a cohesive unit. It’s no secret that twins often have similar personalities, functioning as a type of mirror image of each other; however, Elias and Lukas deviate from the notion of in-tune twins to present opposites in appearance insomuch as they can. Specifically, the boys differentiate through clothing color choices. While the clothing they wear is a standard childhood uniform – tank tops and shorts – one can’t help but notice that Elias and Lukas are dressed in the same exact style without variation on the individual pieces. No one has a trademark baseball cap or handkerchief poking out of a back pocket – these two have to look as close to the same as possible. Variations on this theme include the red (Lukas) and blue (Elias) tank tops worn during play time, the black (Lukas)/white (Elias) comination of exploration clothes, and the gray/navy tank tops with the same pyjama bottoms. The boys are dressed in a type of uniform to mark their solidarity, but each one requires oppositional clothing in order to establish who is Lukas and who is Elias. It’s this establishment that solidifies the two personalities: the “good” twin Elias versus the “bad” twin Lukas. Lukas is the trouble maker: as reflected in his longer hair, he’s a bit more wild and defiant than his brother Elias. Lukas is largely ignored by The Mother (Susanne Wuest) for the bulk of the film, while the more obedient Elias is rewarded with food and speech. Lukas is the one that instigates with ideas, from rescuing the cat, Leo, to tying up the boys’ mother. So while he is more quiet, Lukas is ultimately the one that bears the worst ideas, translating into actions that begin as childhood annoyances toward an adult and culminate with torture. After all, it is Elias that pauses and considers letting The Mother go when she is tied to the bed; it’s Elias that has moments of sympathy and doubt as to whether or not what they’re doing to her is right. Elias is the one that tells his brother to apologize to their mother. Elias is the one that looks directly at his mother rather than turning his head away. Elias is the one that wears the guilty expression when she cries from being burned with the magnifying glass. One is distinctly good, while the other is decidedly more antagonistic in nature. While they look alike and dress alike, the way each behaves represents a polar opposite. It’s staring you right in the face. Which is why it makes sense that in the end, we find out that the boys are one and the same. Lukas is a representation of a dead child, designed to help Elias cope with the fact that his twin brother is not there with him. As such, Elias needs to present himself as a “we,” thus splitting his personality into two archetypes in order to achieve a single identity through what he believes are two separate people; they need to be halves of a whole because the whole is Elias. In the beginning, there are repetitions of Elias searching for Lukas: in the cornfield, near the tunnel in the woods, on the water. It makes sense that Elias refers to himself as “we,” asking The Mother “where our mother went” to assert that Lukas still exists; Elias needs him to exist, so he has split himself in half to create the twin and reclaim him from death. In order to achieve this end, Lukas is a mirror image, though his clothing starts out as slightly different in color: Elias uses the reference point of himself to create the other half that he feels is missing. That is why they have to lay on either side of the dead cat: same position, opposite sides. That is why, when punching each other in the bathtub, the boys go for opposite sides: it’s shadow boxing. When they fight in the bathroom later oni n the film, they are bleeding from the same side of the nose, indicating that the injury is the same. It also explains the mortal terror that Elias feels when their mother tries to get her child to repeat that he won’t talk to Lukas anymore: “She wants to tear us apart.” Elias has already ripped his psyche in half to account for the missing brother; he has given half of himself to make his brother real. To negate that portion therefore means that he would not be an entire person, because he identifies as only one half – the good twin, the one that listens to his mother and feels sympathy. 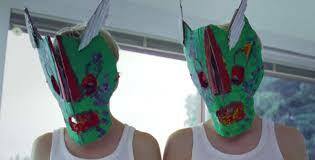 This is why the boys need to don identical green-and-red masks. This is why Elias cuts Lukas’s hair and dresses him in identical clothing halfway through the film so that “she can’t tell us apart.” Elias needs his brother as psychological necessity in order to exist. The thought of separation is therefore not real to him, as he cannot process life without his twin. When the identity is threatened with the confrontation of reality, the two halves team up in order to maintain the need to function as a whole, a defense mechanism is that willing to kill in order to maintain the protective schema. The grand irony of this exercise is that the audience does not know what Lukas’s personality was like prior to the events of the film – we never actually get to know the real Lukas, just how Elias has represented him in order to fill in the blanks of his fractured mind. The Lukas we see is what allows Elias to have a daily life: it is the piece of himself that he has given in order to continue living. In the end, the child does what he can in order to remain whole; for some, being whole just happens to mean that someone else is so integral to your identity that you need to manufacture that person – to sacrifice and transpose yourself – in order to carry on in that person’s absence.